Hello all and thank you for joining us to help celebrate Simon’s new Create Joy release. It is yet another fabulous release with lots of gorgeous products to play with and create with. 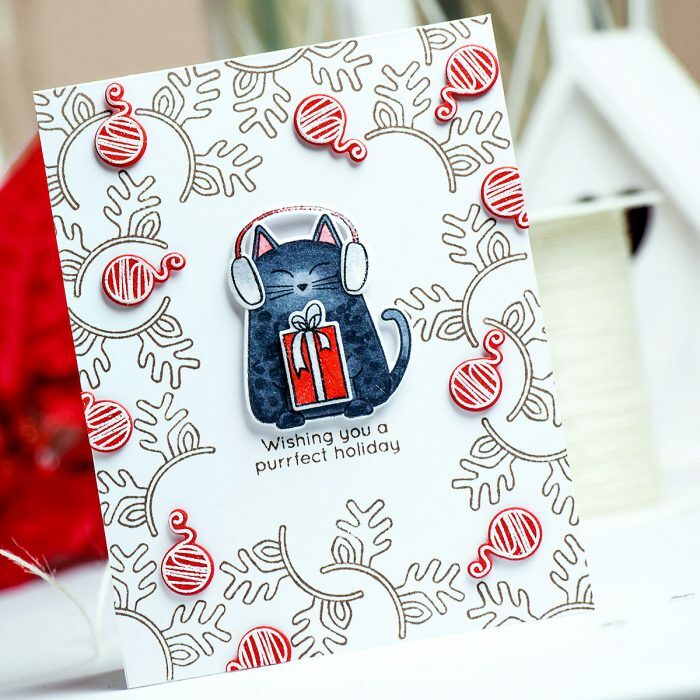 I’m excited to share a card created using Christmas Cats stamp and die set. As a huge cat person and cat lover I’m super happy there’s now a stamp set that features two different cats. My husband and I have 2 kitties and they are just like the kitties in the set – one is round-ish, the other is long-ish lol! Here’s a photo of our kitties, they are both black with a bit of brown and grey mixed in. I am yet to learn how to color them using Copics for my cards. It nice to practice a bit. 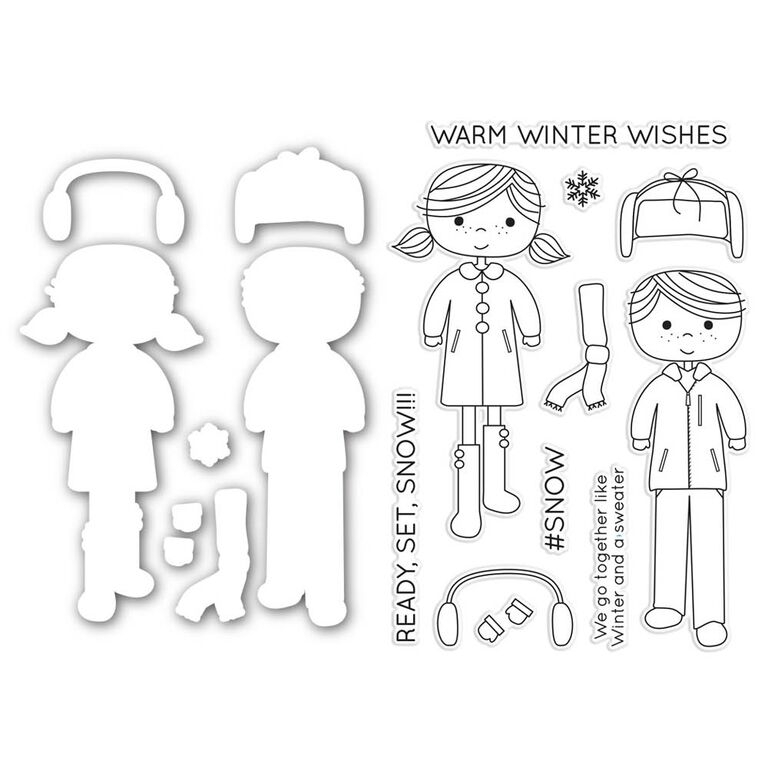 I had to add a touch of glittery snow to my project so I heat embossed the present and ear muffs using Sparkle embossing powder from Hero Arts. Love the result! To add a touch of red I heat embossed a ball of yarn about 10 times onto red cardstock, cut it out using a matching die and foam mounted onto my project. Are you a cat or a dog person? I’d love to know. I am also hoping to add a video showing you how to make this card soon. So stay tuned! Hop along these blogs and talented artists to find lots more inspiration using Simon’s Create Joy products. If you arrived from Sarah Moerman the next stop is Kathy Racoosin. If you encounter a broken link or get lost, start at the beginning at Simon Says Stamp. I’m a cat person! I like other peoples’ dogs, but I like having cats around! I like dimension of the ornaments and the way you’ve colored your kitty. Love the photo of your kitties! I love the way you used that fun little antlers stamp. Awesome card. Yana, love your cat card and the cat picture. Thanks for sharing. Love the cat card . I have 3 cats , 2 dogs and a snake. So I love all animal related cards. I vote for you as most creative use of an accessory stamp! Awesomeness! Love so many of the products! I love the background. You are so creative. Thanks formsharing. the background/border stamping is sooo much fun!!!! Completely adorable card! Love the background design. Thanks for sharing and opportunity to win. I love how you made the background. Such a cute card! I’m not a cat or dog person but I still think your card is cute, especially with the antler and wool ball background! Your card is fabulous. Love how you created the background. I really like this cards, the background is great! 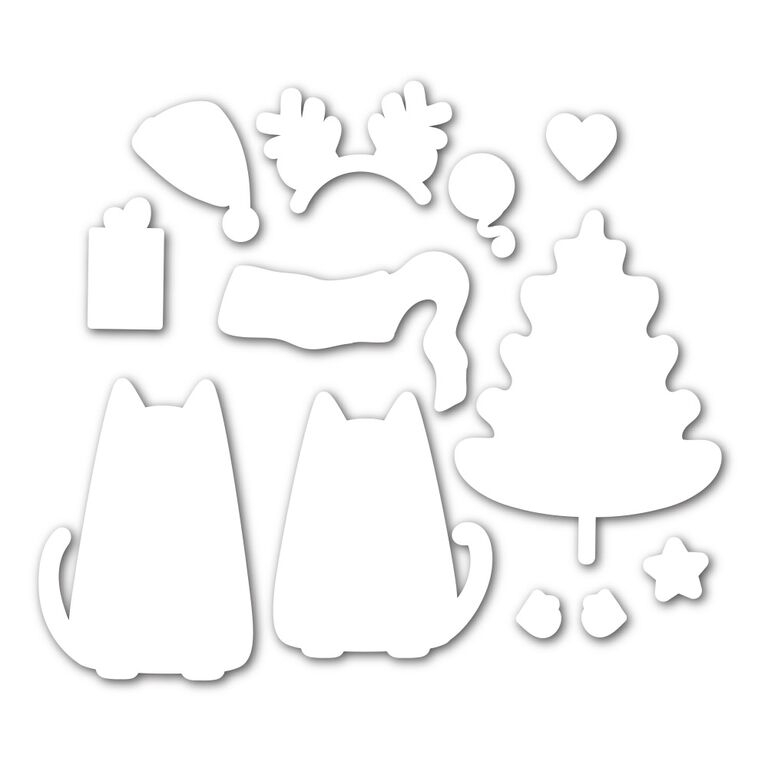 Love where you got your inspiration for the cards……cute kitty’s! I love the simplicity of your background with just a little pop of color. Just adorable all the way around! Loving that stamped frame you created! Such a great card! Cute set and cute card. Hi Yana ~ Such a creative and fun card! Well done. 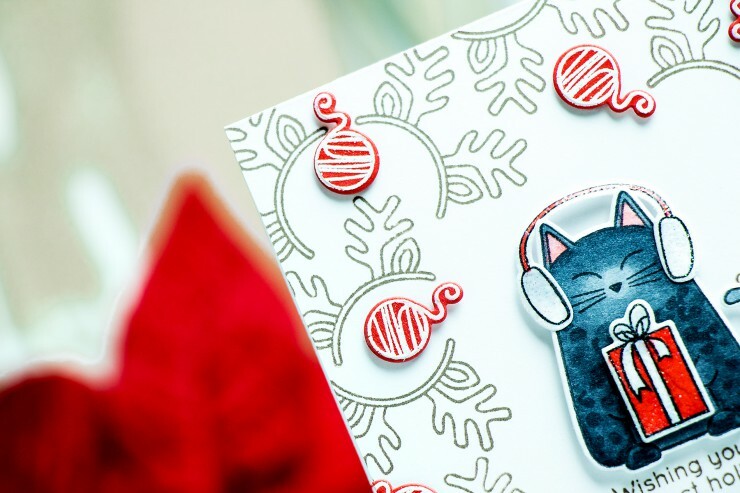 Yana, this card is purrfect! I absolutely LOVE cats, and we have three of our own. Thanks so much for sharing your artistry! Love your card, great kitty! Really a cute card!! I love those cats in the stamp. And your cats are adorable!!! Thanks! Oh my goodness.. Awesome card, and a great background! 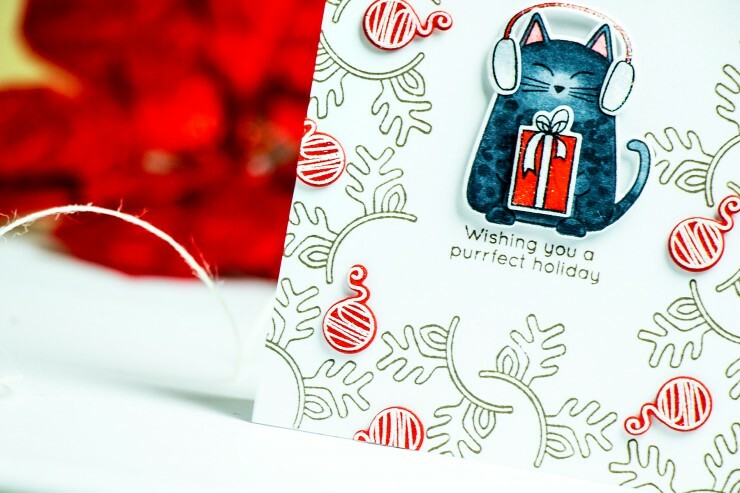 I just love that handstamped background and those adorable little Christmas kitties! So cute! I’m definitely a cat person! Your card is soo cute! Love the background your created, too. 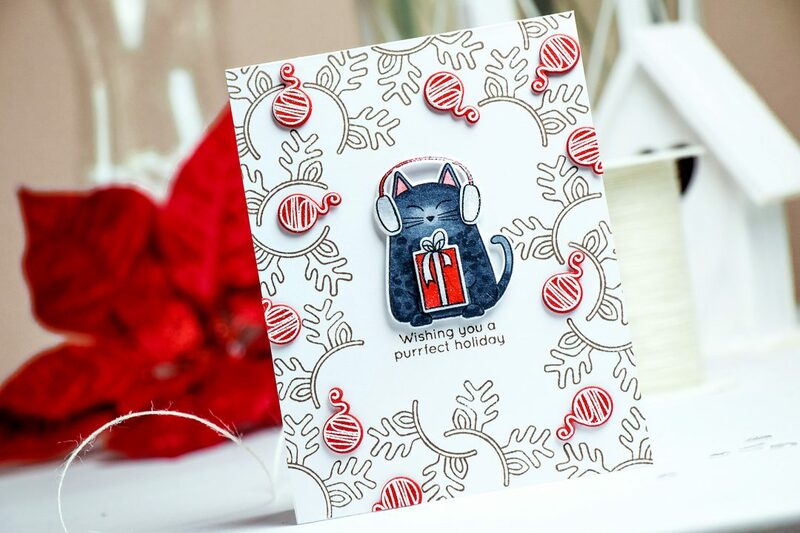 Super cute card – i love the Christmas Cats stamp set – my favourite!! Omg……. I love the background. It took me a second to realize it was reindeer antlers! How incredibly creative! 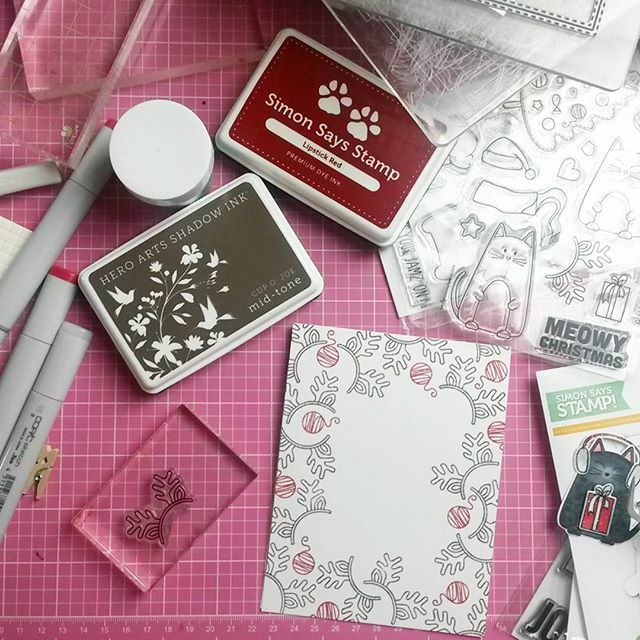 Love the stamped background and sweet kittie colored to perfection! 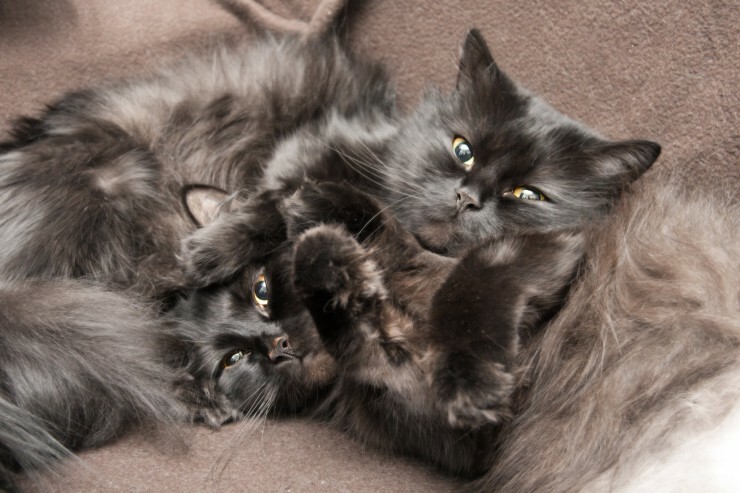 And, love the pic of your cats…so gorgeous!!! Love your kitties – both real and on the card. Very cute. Love your card!! The background you created in stunning! Lovely card as usual Yana.